This is about as fair a way as any to sum up the New Orleans Saints' 2015 long pre-season. They aren't just the worst Saints team of the last decade. They're also the least-compelling Saints team of the last decade — maybe of the 21st century. Four interesting things have happened: Drew Brees injured his shoulder; Michael Mauti's punt was blocked and inspired a win over the Atlanta Falcons; Brees' seven touchdowns against the Giants; and the firing of Rob Ryan. There's a mistake in that paragraph. 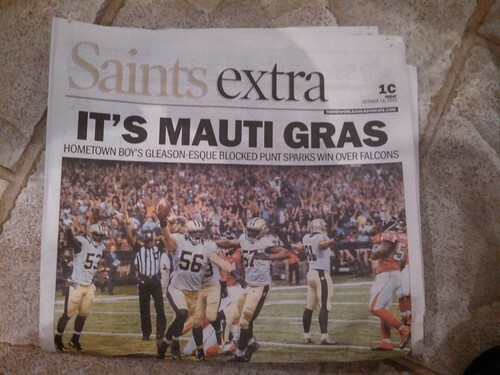 "Michael Mauti's punt was blocked" should read "Michael Mauti blocked a punt." We know Bradley knows this. That sentence is obviously just a typing error of the sort we all make bunches of every day. It's what happens when you begin to type a sentence and change your mind about how you want to say the thing but forget to go back and resolve inadvertent contradictions. So I feel bad for even pointing it out. It's not a deliberate crime against fact or decency or anything.. like, for example..
Also.. and again... we hate to nitpick.. but other interesting things happened. The Saints beat the Cowboys in overtime on national TV with a dramatically long touchdown pass. Drew Brees spent a whole game on the sidelines pretending to play football with some imaginary friends. The Titans beat the Saints in overtime in the Superdome with a dramatically long touchdown drive. The Bensons continued squabbling. Brandon Browner yelled at a reporter. But the larger point is valid. This is kind of a not very fun football season. That's actually much worse than a season when the team is bad. And, yes, there is a difference. Look at what LSU's year has been like, for example. Anyway, there are 5 games left to play in this pretty bland Saints season. If they manage to pull off an upset this weekend, that might improve that assessment a bit.